This is a guest post from my friend Jenn Galloway-Boyce. -O. My introduction to a Paleo lifestyle came from this simple, yet delicious recipe. I had just birthed my first child and trying to find time to cook myself something healthy for breakfast, (while nursing him 200 times a day) was no easy feat. I was told about these tasty little treats during a discussion at my new mom’s group meeting. 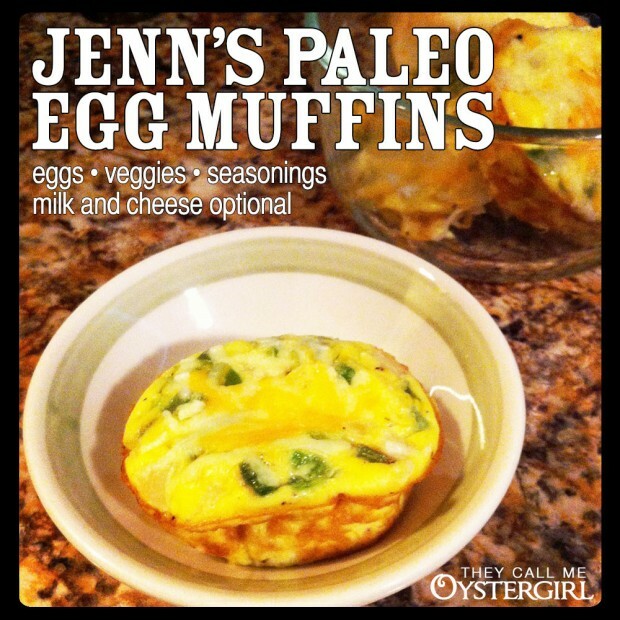 After doing a little research on Google (where I found everydaypaleo.com) and tweaking the recipe a bit to my taste, the Egg Muffins were in my oven that night! There are many different recipes for these online and at various Paleo websites. Here is my version, but feel free to add any meat/ cheese/veggie combinations that suit your taste. There are endless possibilities! I have even made them with a piece of bacon placed on the inside rim of the muffin tin. Yummy! After eating these little pieces of Paleo heaven habitually for over 2 years, I am still not bored with them. And for a Gemini like me, that really says something!! Now that you have everything you need, let’s mix them up! I have added cheese before cooking and after cooking. I personally prefer to add the cheese to the top of the Egg Muffins after cooking. Mix all ingredients together in a medium size bowl and pour into the muffin tin. Easy, huh? Bake at 350° for around 18-20 minutes. I store them in a covered glass Pyrex dish and in the morning I just nuke 2 or 3 for 30-45 seconds. I hope that you enjoy these Egg Muffins! How many servings is this for, please? Jenn says it makes approximately 12 full-sized muffins, using a regular muffin tin. You can stretch that by making mini-muffins.